With Hamas’s fortunes on the decline and Gaza suffering its worst isolation and economic constriction in years, it is only a matter of time until a flare-up with Israel escalates into a major conflagration – unless the two reach a modest understanding to extend a fragile quiet. 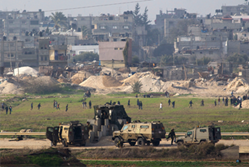 On 12 March 2014, Islamic Jihad, with a nod from Hamas, launched the largest projectile barrage against Israel since the 21 November 2012 Gaza-Israel ceasefire. In its latest report, The Next Round in Gaza, the International Crisis Group examines the drift toward escalation on the Israel-Gaza border. Hamas and Israel have been headed toward a clash since 3 July 2013, when Egyptian President Mohamed Morsi was deposed and Cairo initiated a push to further isolate Gaza. This most recent violence quickly faded, but there are few signs the deeper causes underlying the escalation will be addressed. Neither Israel nor Hamas currently wants to fight a war, but the two major Israeli operations in the past six years, and numerous mini-escalations in between, demonstrate the likelihood of an eventual miscalculation. Islamic Jihad, with its massive retaliation for the killing of its militants, saw an opportunity to push to the forefront of the national struggle and emerge from Hamas’s shadow. Hamas too saw an advantage in the escalation: sending a message that Gaza would not remain passive in the face of isolation and misery. Among Hamas’s limited tools for dealing with its downward spiral is permitting other groups to violate the ceasefire in the hope that a limited escalation would bring about at least temporary alleviation of the closure. Palestinian Authority President Mahmoud Abbas should press for easing Gaza’s closure. This could improve life in Gaza and Abbas’s own position, as well as earn Israel credit for taking action to reduce the risk of escalation. A modest, limited set of understandings should ensure that Gazans have adequate fuel, building materials, and a reliably open Gaza-Egypt crossing at Rafah – and that Israel will be secure from further significant rocket attacks. “Hamas leaders reasoned, accurately, that so long as they stayed out of the conflagration and the rocket fire was limited in distance and duration, a major operation would be avoided”, says Nathan Thrall, Middle East Senior Analyst. “Israel also calculated correctly, signalling its seriousness to Hamas, but not striking so hard as to provoke a much larger confrontation or threaten its control”. “It is a central impediment to a more durable agreement that, while neither Israel nor Hamas has what it wants, both have what matters most to them in the short term. Israel has a ceasefire, Hamas has control of Gaza”, says Acting Middle East and North Africa Program Director Robert Blecher. “Neither wishes to give even a little more for what it already has, but if they do not, both could lose what they now possess”.